A small seed falls into the woods. It grows into a beautiful tree and develops friendships with neighboring trees. 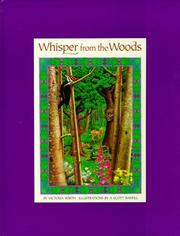 Wirth, Victoria, “Whisper from the woods,” Children's Picture Book Database at Miami University, accessed April 18, 2019, https://dlp.lib.miamioh.edu/picturebook/items/show/9590.